Baseball is known as America’s pastime and it is a favorite among kids. From informal backyard games to organized leagues all the way to the Majors, baseball is a sport that offers something for everyone! 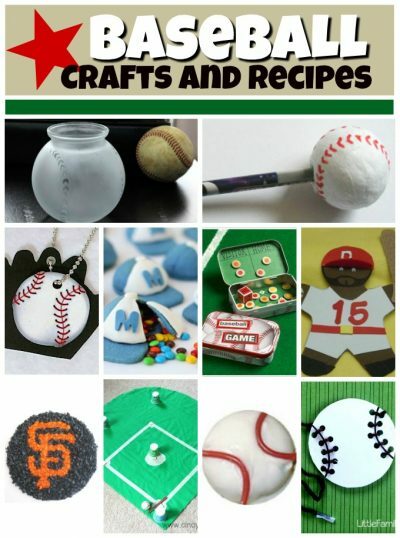 Celebrate this beloved sport with dozens of great baseball crafts and recipes. Here are ten of our favorites. 1. Travel Baseball Game – Turn an empty tin, some paper, wood circles and magnets into a fun baseball travel game. It’s great for passing time during car or plane travel, at restaurants, or in waiting rooms. 2. Tissue Paper Sports Logo – Make a dimensional baseball logo using nothing but tissue paper and glue! It’s really easy to do and can be personalized for schools, colleges or any professional sports team. 3. Baseball Charm Necklace – Use the printable and shrink plastic to make this cute set of baseball charms into a necklace, keychain or zipper pull. To personalize it, write the jersey number of your favorite player in the center before shrinking the plastic. 4. Baseball Cookies – These no-bake cookies start with store-bought vanilla wafers. They are quick and easy to assemble and taste great. 5. Etched Baseball Vase – This vase is perfect for any baseball lover to make and enjoy. It also makes a wonderful gift for a player, coach, or fan. 6. Baseball Lacing Craft – This lacing craft helps little crafters develop their fine motor skills. Take it along to an older sibling’s baseball game or practice to help pass the time. 7. Dixie Cup Baseball Game – Transform a ping pong ball, craft stick and Dixie cups into a fun baseball-themed craft that you can actually play! It works just as well indoors or outdoors. 8. Baseball Pencil Topper – Turn a paper mache ball into a cool baseball pencil topper! This craft is great for a sports-themed party or event. 9. Gingerbread Man Baseball Player – This fun craft is inspired by gingerbread men. Follow the directions to create your favorite baseball player, yourself, or your coach. 10. Baseball Cap Pinata Cookies – These personalized Baseball Cap Pinata Cookies are great for baseball fans of all ages. They’re just as fun to make as they are to eat! 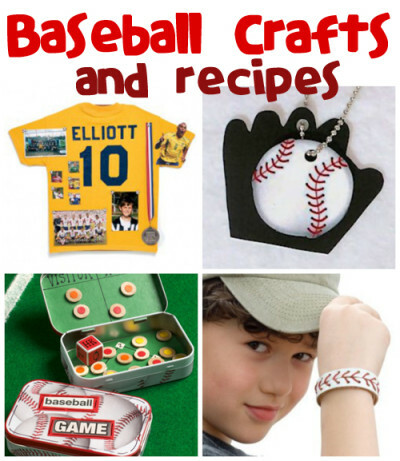 Be sure to check out all of our baseball crafts and recipes!